Today was the deadline for paying sales tax to the state for book sales in 2011. I keep the sales of my books in separate Excel spreadsheets. At the end of the year I put them all together in a Word document, separating the taxable from the non-taxable sales, so that I have my back-up documentation for the beloved government. 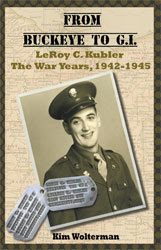 Over the weekend I did one last check on Internet sales because I knew that an acquaintance had purchased "From Buckeye to G.I." at the end of the year and I wasn't sure if it had shown up on my Lightning Source sales sheet yet. Just for fun, I then checked my Amazon Author Central account to see what was going on. 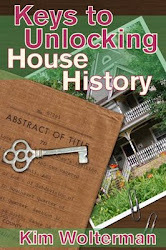 Lo and behold, 8 copies of my ebook "Keys to Unlocking House History" have been sold! Of those, 7 sales occurred in 2011 and 1 in January of this year. How exciting is that?!? I guess Amazon doesn't feel the need to notify its authors when sales are made, and they will not issue an author payment until they owe you $10 or more. They owe me more than that now, so I should be receiving a payment from them. Knowing how they operate it will probably be after the end of the first quarter before they pay anyone. What is interesting is that while my ebook has been available through Smashwords and all their affiliates since the summer, not one copy has been sold through them. The ebook has only been on Amazon since October. Besides the fact that it is Amazon, I wonder what they do differently that has enabled my ebook to be found on their site? No new stories have been bouncing around my brain struggling to get out. I don't have a new book idea on my list of 2012 New Year's Resolutions. (Actually I don't have a list at all, but that is neither here nor there.) The point is that I don't know what my next project will be. So when I saw a post for The Family History Writing Challenge it sort of grabbed me by the throat. I have been researching my family, as well as my husband's family, since 1989. I have lots of names, dates, places, documents, photos...well, you get the picture. Pardon the pun. Other than having a public tree online that family members can look at if they so desire, all these materials in my file cabinets really don't do anyone too much good. At the moment I don't see anyone who will even want to take care of my treasure trove once I am gone. Compiling the information into a family history would ensure that things (at least some of them) are put together in one place. So the point of The Family History Challenge is to write your story for 29 days in a row - basically the month of February. You set your own goal of how many words you would like to write each day. Inspirational reminders will be emailed to the group daily, and there is a forum where we can ask questions and offer support and encouragement to each other. I have decided to take the Challenge. At first it seemed an easy decision to write the history of the Crusham family (my mom's) from Tuam, Ireland to Cincinnati, Ohio. After all, I traveled to Ireland to find out the REAL name of this family (Crisham), and have lots of photographs and some interesting documents. But as I have been giving this some thought I realized that while I have a lot of facts and figures, I'm not sure I have many stories to tell. Sure, I can fill in with historical information from Tuam and Cincinnati, but is that enough? I began to fret that I really would not be able to come up with 250 or 500 words a day on the family. That led me to consider writing my own story; my memoir. I have no illusions that anyone besides me would be interested in this topic. A Crusham family history would perhaps appeal to the hundreds of Crusham folks living in Cincinnati. But the point of this exercise is not to come up with a book at the end - though that would be a nice bonus. So I am stumped at this point. I'll take the next couple of days to pull out all my Crusham materials and really see if I have a story to tell. Then I'll decide which direction to go with this Challenge. This morning I had a meeting with clients to discuss a book that they are just beginning to write. For the time being, I am functioning in the role of book coach. I told them, as I would advise anyone who wants to write a book, that they need to first determine who the audience is for the book. (And PLEASE don't tell me that the book is for "everybody"! There are very few books, especially non-fiction, that will appeal to everybody.) Until you determine who is going to read your book, you really don't know the correct way to write the book. So that is a huge hurdle right from the get-go. But I think they are up for the task. In the meantime, they have a public relations firm who will be looking at existing books in the market to see who is their competition. The conversation made its way around to the publishing aspect. Like most authors they would like to go with a traditional publishing company. However the nature of their topic is fairly time-sensitive, in their case meaning others will probably be getting similar books out sooner rather than later. I told them that even if a traditional publisher picked them up, the book would not be out for 1-2 years after they submit the manuscript. That is not an option, really, unless an educational publisher has a quicker turn around time. I offered to publish the book under my company name. I have considered doing books by other authors in the past, but it really comes down to the contractual arrangement. Who pays for what? Who handles distribution? What about the marketing? How are the sales split? These are all things that would need to be resolved. I also would probably want to pick up some liability insurance coverage as well, since I could be sued along with the authors if something is awry in the book. There are lots of things to think about. Having said that, I think it would be exciting to publish a book for someone else. It would also add more credibility to my publishing company. For right now, I am just going to enjoy helping these two authors make their dream a reality. Since my daughter is home I decided to have her look at myhousehistory.net to see if she could determine why I am unable to sign into the website, and therefore unable to post any updates. She simply had me go to my axspace.com account and log in through it. And it worked! In the past I had always logged in directly from the myhousehistory.net home page. For whatever reason that no longer works, but that is fine with me as long as I can ultimately get where I need to be. Now, I'm sitting here wondering why the brainiacs at axspace and the other consultant I have been working with did not make that suggestion. Man, this stuff frustrates me! I wish I knew a whole lot more about it so I didn't have to rely on anyone else. I still need to move the domain name and the website hosting to another company, and unfortunately my daughter does not know how to do that. I'm not sure who I will hire to take care of this since I don't really have much faith in the people I have dealt with in the past. It is probably not that they are incapable of doing the job, but their response time is pretty poor. I guess I'll ask around and see if anyone has a company they can recommend.